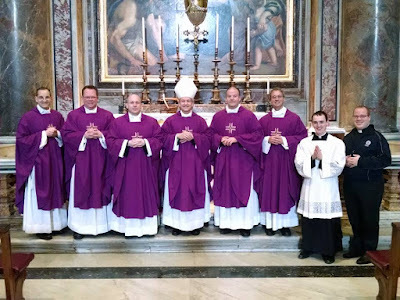 With the celebrations accompanying the installation of the Very Reverend Peter C. Harman - a fellow Quincyan and son of the former St. John the Baptist parish - as the 23rd rector of the Pontifical North American College this past Sunday (though the appointment took effect February 1st), the past several days have been rather full. Several of Father Harman's friends and family from Quincy and Springfield - including His Excellency the Most Reverend Thomas John Paprocki, Bishop of Springfield in Illinois, and several priests of the same diocese - joined us in Rome to help celebrate the joyful occasion. Despite the presence of our Bishop, the most notable of the guests was Father Harman's mother, Betty, whom I remember very well from our home parish. Because of my class schedule and the process of writing my thesis (which is coming along nicely after a few surprises here and there), I was unable to join the group of pilgrims for all of their activities, but I was happy to join them when I could. 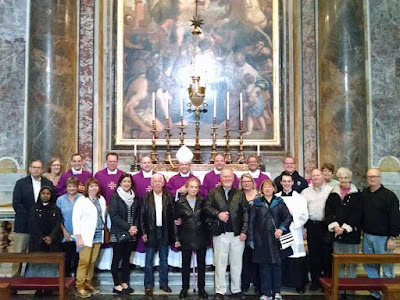 The group arrived on Thursday morning and offered the Holy Mass at the tomb of Pope Saint John Paul II this past Friday morning, celebrated by Bishop Paprocki. On Sunday morning, within the celebration of the Holy Mass, Father Harman made the Profession of Faith and took the Oath of Fidelity. 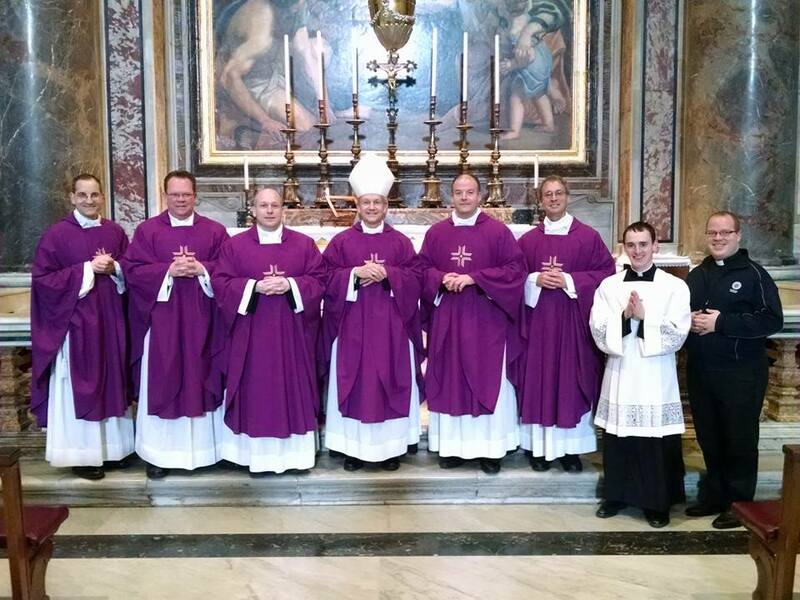 Afterwards, His Excellency the Most Reverend John J. Myers, Archbishop of Newark and Chairman of the Board of Governors of the Pontifical North American College, formally installed Father Harman as the Rector. 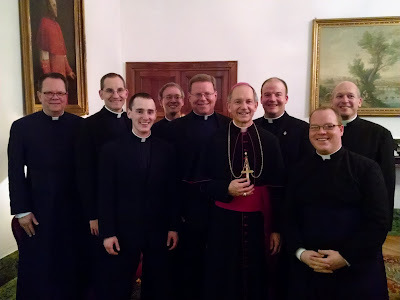 During his remarks before dinner to the Pontifical North American College, Bishop Paprocki, noting Father Harman's home of the Gem City, said, "Father Harman has a heart of gold, so our diocese is sharing with all of you one of our gems! 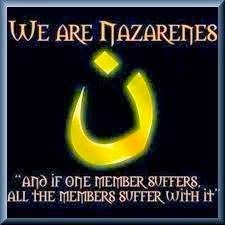 I give you a pastor, a priest who thinks as a pastor, serves as a pastor, and loves as a shepherd cares for his flock." Given the enthusiastic responses of the seminarians throughout the day, and especially during the remarks made by several people before and after dinner, it is clear that the seminarians value Father Harman's presence at the PNAC very much. Though I was unable to join the pilgrims for their tours of the churches and historical sites in the Eternal City, I was able to join them for dinner on several occasions. They seem to have thoroughly enjoyed themselves and I enjoyed their company. More importantly, though, they were able to grow in faith, especially through their visit to the tomb of the Prince of the Apostles, which is, of course, the goal of every pilgrimage. 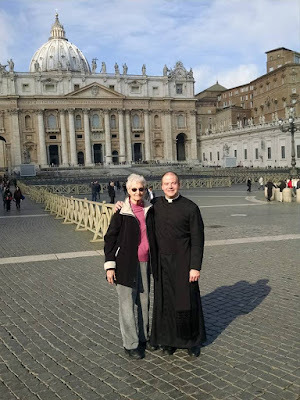 I wish Father Harman well in his new ministry at the service of the Church and ask you to join me in praying for him each day as he seeks to form men to be shepherds after the heart of Christ. Registration now open for TEC Encounter 2016!